Giving long lasting protection from damage caused by wet rot, dry rot, decay and fungi. Low solvent, low odour solution based on Micro-fine active technology. Penetrates the wood with fungicides and algaecides effectiveness is much greater than standard wood preservation products. Ultra light fast pigments on the coloured variants give an even fade resistant finish which will last for years. 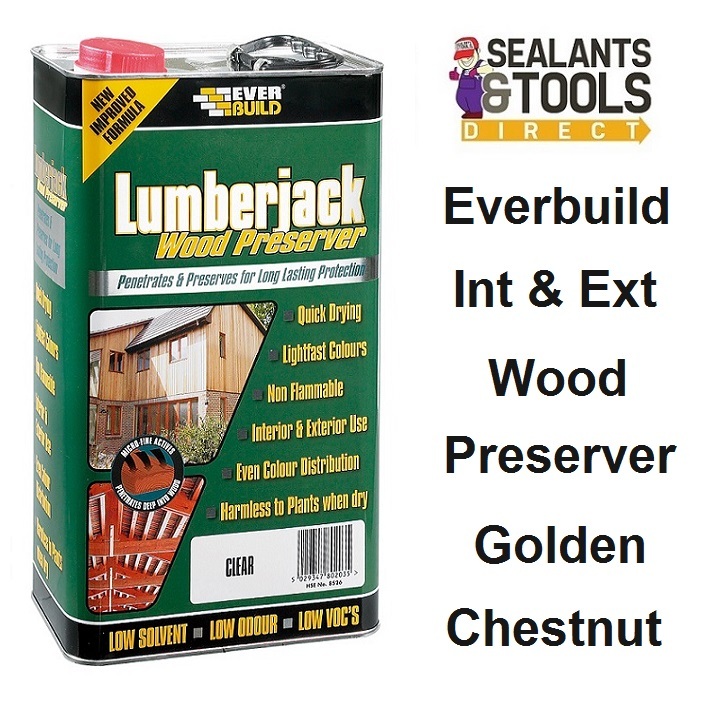 Lumberjack Wood Preserver fast drying and non flammable. Application to Damp timbers is possible without loss of performance. Wood Preserver - Fir Green, Dark Oak, Golden Chestnut & Red Cedar: Ideal for general use on rough sawn or planed timber such as window frames, fences, sheds, cladding, horticultural timber, roof timber, joists etc. Fir Green is particularly useful for easy identification of treated timbers and horticultural work. These colours can be over painted, stained or varnished later if required. Wood Preserver - Clear: For use on interior or exterior rough sawn or planed timber such as floorboards, joists, roof timbers, window frames and doors. This product is an ideal pre-treatment which may be over painted, varnished, or stained when dry (allow 48 hours drying time), but on interior applications, it may also be left as the final finish for a natural wood effect. However, when used externally, over painting/staining is recommended, as this product does not repel water.